A note before we begin: This is an image I have been sitting on for a while, because I know the kind of controversies it could stir up. However, with a little bit of history and a little common sense, I think we could all navigate the shores of the Rivers of America easily today. On the dock belonging to the Big Thunder Mining Co., at the base of Big Thunder Mountain, rests a crate full of tools and stories. H. Abiff, or as he is more commonly referred to, Hiram Abiff, is the chief architect of King Solomon’s Temple according to the Freemasons. In an allegorical play, presented during the third degree of Craft Freemasonry, Abiff is killed by men who seek the secret password of the Master Mason. This performance is meant to instill the lesson of the trustworthiness of a man’s word. While there is no Hiram Abiff in the Bible, a correlation has often been cited since, in Masonic ritual, Hiram is mentioned as “The Widow’s Son,” while in the Bible, there is a Hiram who works in bronze and is contracted by King Solomon to create bronze furnishings and ornaments for his temple, and is also described as the son of a widow (1 Kings 7:13–14). While this is the most likely of the Hirams from the Bible the name Hiram is also referred to in 2 Samuel 5:11 and 1 Kings 5:1-10 as a king of Tyre, and again in 2 Chronicles 2:13-14 as a craftsmen sent from Tyre to assist in the construction of King Solomon’s Temple, though this latter version is commonly spelled Huram. Now, dedicated readers and researchers, now that I have opened the Freemason door, let me dispel certain rumors that you might encounter should you beginning digging for historical data between Disney and the Freemasons. There are stories abound that relate how Walt Disney was a 33rd degree Freemason. 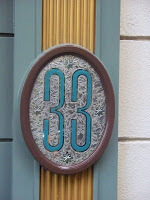 These stories use the Disneyland’s Club 33 as evidence of his status and also claim that Disney’s brand of entertainment was meant as a plot to scramble young minds and that his films were full of symbols and ideals of the occult (these are, I assure you, the most docile of the claims). Walt Disney did belong to DeMolay (a youth organization for young men that is Masonic-sponsored), as did Mickey Mouse, in his formative years, and Disneyland did sponsor a Masonic club for its employees (along with a skiing club, shooting club, bowling teams, etc. ), but these two instances are as close to the Freemasons as Walt Disney comes. I hope everyone made it around this bend in the Rivers of America. These waters can be tricky at times, but, if you keep your head about you, and above water, you just might find you learn something new every now and then. I can't imagine Walt having the time to be a Freemason!